After a big night out, hangovers all round, we have always found ourselves to be unusually popular amongst our friends. Why? Because we’re known to be able to produce the ultimate answer to a hangover. Usually- cheese, cheese and more cheese!.. oh and a good helping of carbs and chili, preferably all sizzling away. We both shared this pleasure whilst living in New York in our early twenties, waking when all you can fantasize about is what you’re going to eat and do, maybe even tipple on. Pizzas and bloody marys at Gemma on Bowery in the East Village was a pretty special place for the bleary eyed us, sitting outside sunglasses firmly in place, jubilantly/hazily talking about the night before and watching the trendies walk by. Well, we make pretty good breakfast quesadillas and spicy scrambled eggs; eggs are one of life’s little miracles, they are so incredibly versatile and one of the most important contributors to the armory of cooks. This is an ideal feast to share with friends on the weekend, and in fact we love cooking like this- making dishes that are interactive, without formality or stress- allowing everyone to chat about the food and be creative, having bowls of different dips, sauces, herbs and chilies to add brings the excitement into the eating. 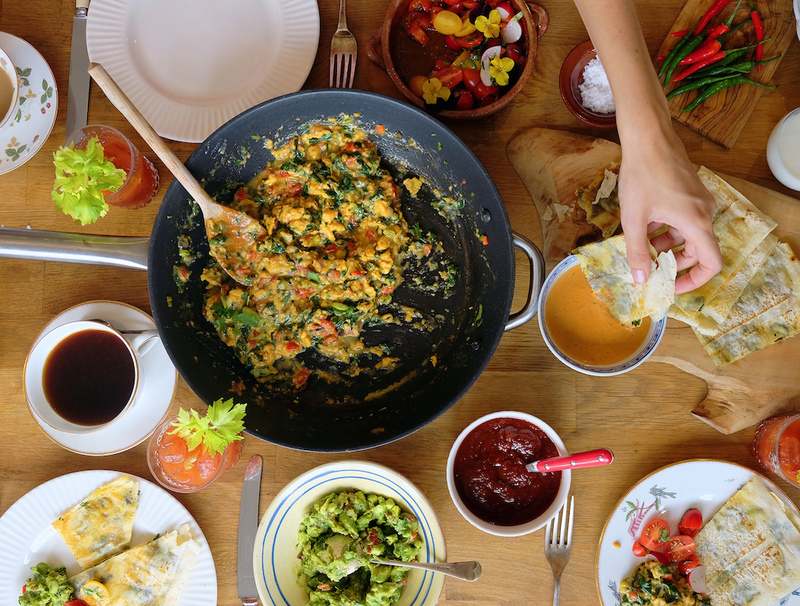 This is a spread inspired from travels in Mexico a few summers ago- delicious scrambled eggs that combine spring onions, chili, cumin, coriander and tomato- which plays on the visceral connection with its pretty colors and also taste explosion. Perfect alongside our cheesy quesadillas, guacamole, salsa and chipotle mayonnaise. Its the kind of food that reverts you back to being a child- where you can grab across the table; you are your own boss of your plate. Highly recommended to make a big jug of bloody marry, we would actually make that compulsory. Even though London restaurants have started to clock onto the breakfast/ brunch craze (long are the days of the greasy spoon), so many places which were never around when we were children or even in our teens- places with a good mix of healthy dishes to ones that fulfill those cravings of pancakes and eggs, its seems that brunches at home with loved ones, the weekend papers, a mouth watering table of food, pots of tea, cafeterias and the blissful thing of not caring about what time it is has succeeded even more. People are loving entertaining again, as this can be done in such a relaxed way. We hope this dish inspires the domestic goddess in you.